Is it possible to ever have too many earrings? Shoes, maybe. Earrings, certainly not! 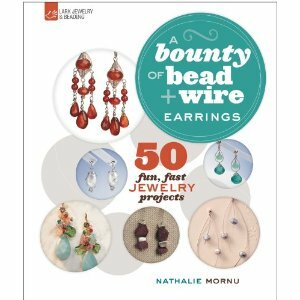 Nathalie Mornu to the rescue with her new book published by Lark: A Bounty of Bead and Wire Earrings. Twenty five talented designers bring you fifty fun and fast earring projects. The basics of wire work are covered, and then it's on to the fun! I particularly like Melody MacDuffee's designs, so I was glad to see her included in the designer list along with Kimberley Adams, Sharon Bateman, Candie Cooper, Terry Taylor, and lots more that you will recognize. The instructions are clearly written, and most of the designs are simple enough to work out anyway, but there are also some illustrations that will keep you on the right path if you are a beginner. The only thing I wish were included that is not is a resource list. Many people will have no idea where to find some of the materials used, but all I can say is that this will hopefully force the reader to become more creative and encourage substitutions.